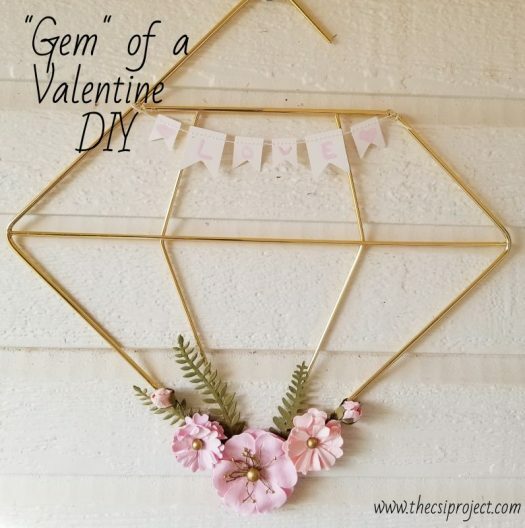 Whether you celebrate Valentine’s or just an excuse to get the girls together and do a Galentine’s Day, you need this “Gem” of a Valentine DIY. It is simple, elegant and easy to make. I found this gold scarf hanger shaped like a gem at Walmart. Look in the laundry/hanger aisle. I loved it and had no clue what for but I just loved it. I bought paper flowers and a small banner at Hobby Lobby and now it can be a sweet Valentine or Valentine decor. I wanted the colors to be soft and sweet, so I used a light pink for the banner. These flowers were perfect with the gold centers. How sweet would a wall of these be at a Galentine’s party or any Valentine’s Day dinner party! Make one for every guest. Also, would a be a cute teacher gift. You are a “Gem” of a teacher. Even think Mother’s day coming in a few months! Too cute with a ton of creative possibilities! This is so pretty! What a lovely decoration for Valentine’s Day or spring in general! Thank you for sharing, and for being a part of the Hearth and Soul Link Party. Hope to see you again this week. Have a lovely week ahead!